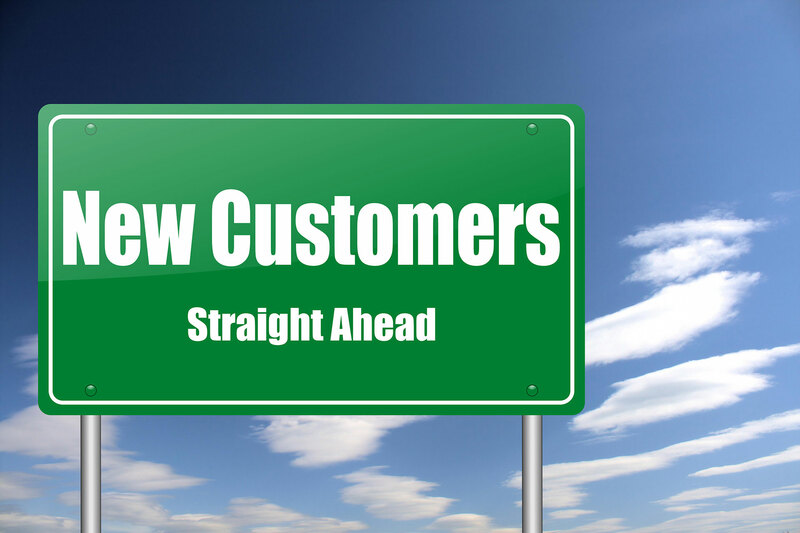 If I build a new website will I get more customers immediately? Ehhhh, wrong! I’m sorry to say it, but that is absolutely not true… and here is why. We have all heard that thought experiment “If a tree falls in a forest and no one is around to hear it, does it make a sound?”. Well, here is my version of a thought experiment. If a business builds a website and doesn’t promote it, does anybody know it exists? Think about about it. If I build a brick and mortar store in the middle of nowhere and I don’t tell anyone about it, chances are no one will ever know it’s there, never step foot inside, and therefore I will never make any money. I may get lucky with an occasional drive by, but if I am hard to find that is also unlikely. There are thousands of businesses in your specific industry that are fighting for the best positions in search engines. Many of these companies have had their websites being crawled by Google for years and have a history of traffic to their site already. Often times companies are paying marketing companies to make sure they are ranked well in search too, whether it be SEO, Pay-Per-Click, Social Media or otherwise..
Look how many links you are probably competing against in search results. 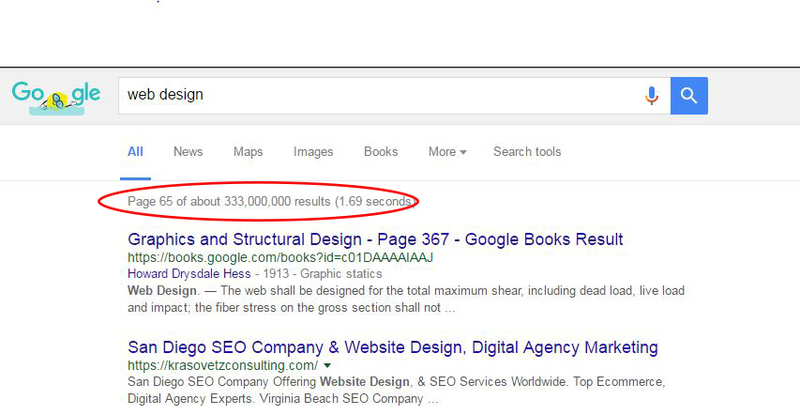 I typed in Web Design and there are over 330,000,000 results. So, now that you know how stiff the competition is and why simply creating a website is not enough, the question you should be asking yourself is “How do I make my website more visible in search and drive traffic to it?” There are many ways you can do this and I have already named a few, but I will list some popular options and how they are helpful. Pay-Per-Click: this is a great option for new businesses that need immediate traffic to generate sales and revenue. Its the instant gratification method because if done correctly, you are creating your position in search by setting a specific budget you are willing to pay per click. Google Adwords and BingAds are platforms that allow you to create different ads and then using keywords and daily budget, you can drive traffic to your website immediately. If you setup your campaign properly and do research you will be able to convert these “instant” visitors into buyers or leads. Search Engine Optimization: Unlike a PPC campaign, SEO is more of a long term process and result. It requires a lot of effort and a number of different marketing techniques to be done with successful results. SEO efforts can take several weeks to a few months to bare any real fruit, but those results are long lasting, whereas PPC results end as soon as you pause or cancel your campaign. Social Media Publishing: This one can be tricky because, simply publishing, although a good thing, doesn’t necessarily give you the best possible results. Doing business via social media is somewhat of an art form. Some people are very good at it and created their entire business around it and have been very successful. That doesn’t happen for everyone that uses social media to promote their business. Like the saying goes, though, “you can’t succeed if you don’t try”. The most important thing to remember is that its all about content. The best and most interesting content wins. Banner Advertising: You see them on every website you visit these days. Often times they annoy you and sometimes you click on them because you see something you like. Well, you can annoy people with your ads too! Seriously, all kidding aside, banner ads are extremely common and surprisingly not too expensive. They can be targeted to a specific group or criteria and if done properly can get pretty good results. I probably would put all my marketing dollars into this type of advertising as it can be pretty hit or miss, but definitely give it a try to see if it works for you. Create a foundation with good code and design. The first step will be setting your site up for maximum conversions so that when you do drive traffic to the site your visitors become buyers or at least a lead. How do we do this? Well, it starts with the design. I am not necessarily saying your website needs to be the Starry Night of websites, but it needs to present well, have an easy to understand message and provide a clear path to contact you. After the design comes the onsite optimization. making sure your site has quality meta titles and descriptions and ideally you have a specific focus keyword on each page that has text. This keyword should be used in the body of the content, the title and if possible the page url. What it all boils down to is that if you don’t promote and market your website, it is unlikely you will ever get any significant traffic to it. No traffic, no money and quite possibly no more business (if the website is to be a main revenue stream). If you don’t have the money to spend on paid marketing , guess what? Social media publishing is FREE. Pretty much everyone has a Twitter and Facebook account and you probably do to. Use them! If you don’t have them, they’re easy to create. G4 Design House can help you with all of the above. Give us a shout for any questions you may have.